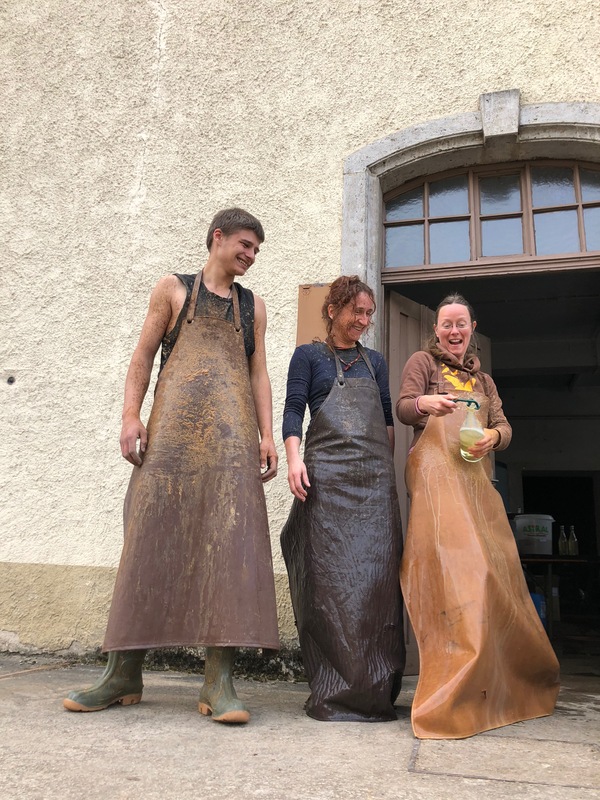 We’ve been making Pet-Nat for a few years now. Since the beginning there has been a huge interest how it’s done and so I thought it’ll make sense sharing our experiences and describing how I currently do it in a blog post. From the beginning on our goal was to end up with a pressure of 2,5 bar to match the German definition of a semi-sparkling wine (“Perlwein”). And because we like these kind of bubbles. Reaching these 2,5 bars is not that simple and involves a little bit of math. And most importantly: pure juice from healthy soil. In the beginning there is a simple formula: 4g of sugar make 1 bar. But actually, it’s not that simple. If you try it that way you’ll always end up with a much higher pressure. It drove me crazy. For years. Until I realized: the juice is still fermenting so … it produces CO2 and of course it does have bubbles already! If you put fermenting juice in a sparkling wine bottle and measure the pressure it can easily reach 1 bar. So: if I want to achieve 2,5 bar in the bottle I will measure the pressure of the fermenting juice first. Let’s say it’s 1 bar. So I just need 1,5 bar in addition which equals to just 6g of sugar. If I want to disgorge I’ll go up by a little less than one bar so maybe 3g of sugar. I disgorge warmly so I loose quite a bit of pressure doing that. After bottling the bottles will lie in boxes until they have finished fermentation. Then we’ll turn the bottles upside down. Sometimes there can be big (and long) chunks of tartar which are hard to impossible to remove by disgorging. In this case we’ll break them by giving the bottles a decent shake before turning them upside down. It will take a couple of months till the bubbles have integrated making them finer and more stable. From that point on the Pet-Nat can either be disgorged or aged longer. This way you can simply calculate how many parts of sparkling and still wine you need to achieve your goal. The rest is simple: Having 3,5 parts in total and a 75cl bottle 1 part = 75/3,5 = 21cl so you need 21cl of still wine with 0 bar and 2,5 x 21cl = 54cl sparkling wine with 3,5 bar to achieve 2,5 bar total. You can use a different wine to make a blend or the same wine in a non-sparkling version and put the leftovers back in the tank. Many options, no waste. Take care though to empty all bottles the same way as you will loose more or less pressure depending how foamy the Pet-Nat gets when you pour it from the bottle to a bin. We use a simple bottling machine to top up the bottles. It’s quicker than doing it by hand and all bottles will be equally full. After that we just close the bottles, clean them and let them dry for labelling. I hope this answers some of the questions out there. Let me know if I got something wrong, if you know another trick or if I missed out on anything!